Over 30,000 fireworks will be shot up into the skies over Israel on Monday night, as towns and cities celebrate Yom Ha'atzmaut (Israel Independence Day). 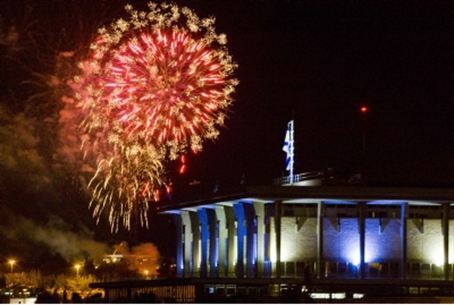 The official celebrations will take place in hundreds of locations, with cities, towns, kibbutzim, moshavim, and small villages all holding celebrations that include top-name singers, games and sing-a-longs – and, of course, fireworks, for many the highlight of the evening. Fireworks can be dangerous in the wrong hands, and they are illegal in the hands of anyone not authorized by the Economics Ministry to use them. So, inspectors from the Ministry will be spending Sunday and Monday inspecting the fireworks to be used at celebrations, the firing mechanisms, and the method of firing, ensuring, for example, that the fireworks are set off at a safe distance from where crowds will be watching. They will also be checking to make sure that the person setting off the fireworks knows what he or she is doing. Three years ago, an individual who was assigned the job of setting off the fireworks by his local government was fatally injured when an explosive blew up next to him, instead of in the sky. Two years ago, several youths found a large firecracker that was fired but did not explode; miraculously, it did not explode when they tried to move it, although it did explode when police set it off in a controlled manner. Officials said that they would be inspecting the fireworks very carefully to ensure that they are up to legal standards, and checking to ensure that all safety procedures are followed. The penalty for using substandard fireworks or employing individuals who lack the proper skills or credentials will be “very stiff,” officials promised.